Can anyone put names to some of these faces? Also see Netball Teams Benfleet School. Many of the Benfleet Junior team also played for the the South East Essex District Team. M. Della (S. Benfleet, 1), A. Phillips (Thundersley, 5), K. Turvey (Wickford, 6), R. Howard (S. Benfleet, 6), P. Wells (Hadleigh, 6), T. Hough (S. Benfleet, 6), S. Cutlan (Rayleigh, 1), G. Lovett (S. Benfleet, 1) D. Christopher (S. Benfleet, 1), B. Reed (Capt. Rayleigh, 6), I.Tyrie (Hadleigh,2) D. Briggs (Wickford, 2) P. Moore (Rayleigh, 6) J. Peters (S. Benfleet, 1), J. Austin (Markham Chase), D. Ives Rayleigh acted as reserve for each game. From South East Essex Primary Schools’ Sports Association handbook. 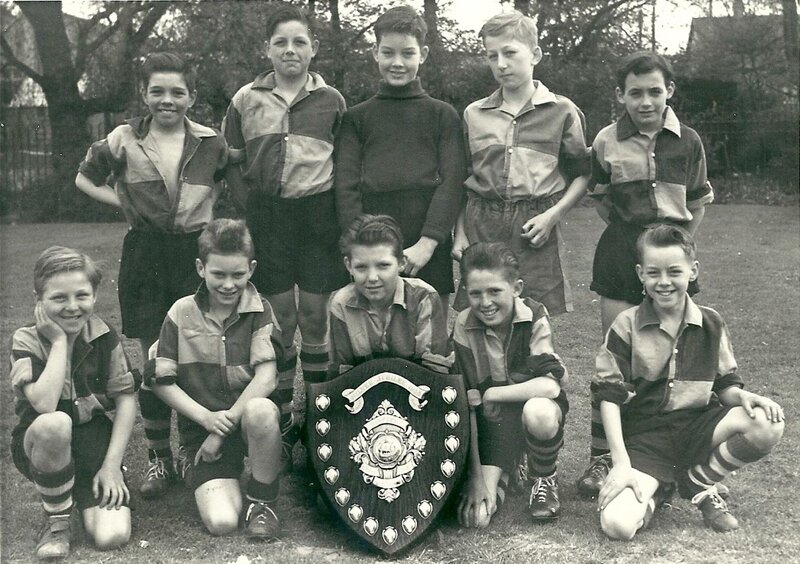 1958 -59 Benfleet Winners of the Benfleet Shield. 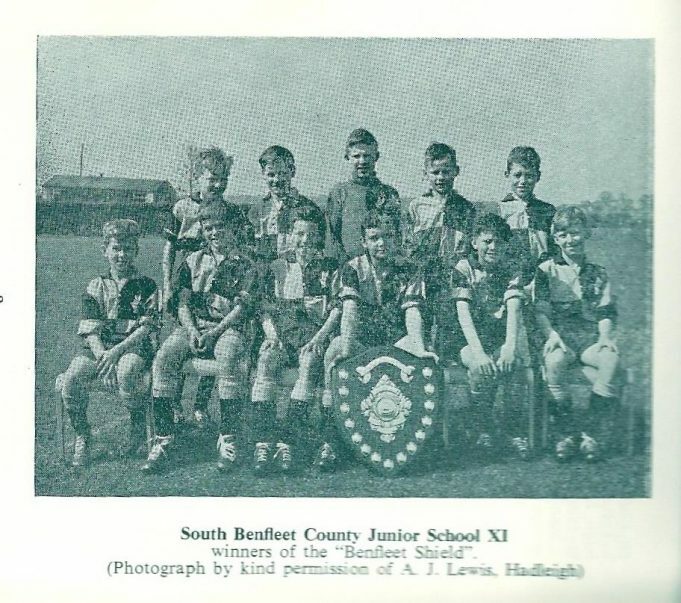 Benfleet Junior also won the cricket trophy. 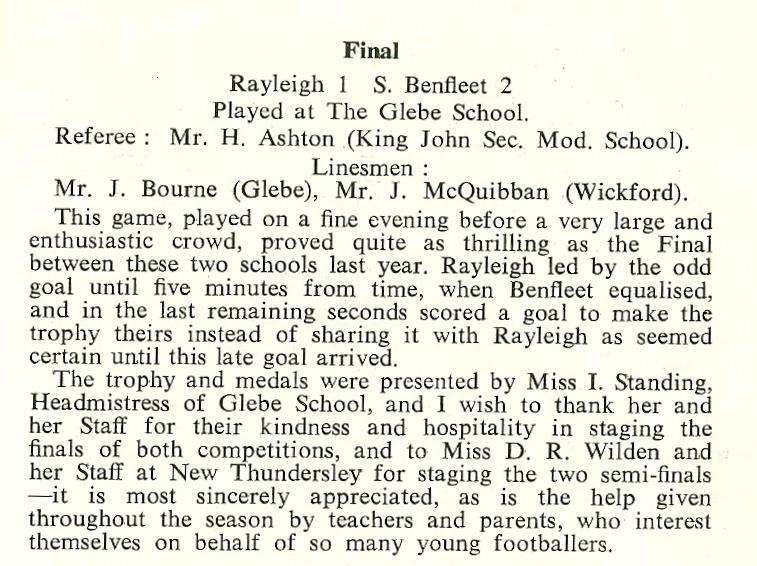 I was one of the players in the first Cricket Trophy Finals which we won at Glebe School. I didn’t think it was really all that fair though. The winners got the Trophy, which we saw for a very, very short time before we went on to our secondary schools and the losers (Glebe School) got a medal each as runners up. Even the write up seems biased?